Layer of protection analysis (LOPA) is a special form of event tree analysis using fault propagation modelling to determine fairly accurately the frequency of an unwanted event. Determine and list all of the initiating events that can cause the unwanted impact. Determine and list all the layers of protection that are available for preventing an initiating event from propagating into the unwanted impact. Quantify the frequency of the initiating event(s), based on historical data and engineering judgment. 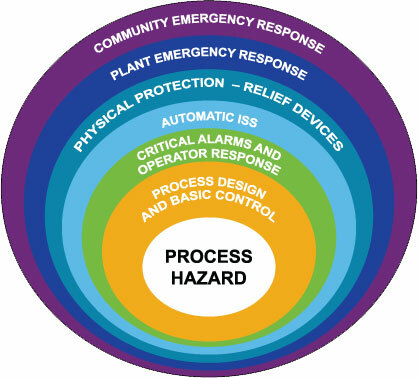 Quantify the effectiveness of the layers of protection in terms of probability of failure on demand (PFD), based on historical data and engineering judgment. Calculate the resulting frequency of the unwanted impact. Lowers the life-cycle cost of SIS. Supplements existing procedures (e.g., hazard matrix, risk graph).Adding LOPA does not require an organization to completely change other procedures. Neither excessively complicated nor time consuming. More accurate than purely qualitative estimates. Identifies potential gaps in the plant’s overall protection that can often be fixed very economically.